"Unemployment is like a headache or a high temperature—unpleasant and exhausting but not carrying in itself any explanation of its cause." Job growth has been healthy for five years.1 However, many people still express concern over the health of the overall labor market. For example, Jim Clifton, CEO of Gallup, states that the "official unemployment rate, as reported by the U.S. Department of Labor, is extremely misleading. "2 He proposes the Gallup Good Jobs rate as a better indicator of the health of the labor market. At the heart of Clifton and others' concern is what the official unemployment rate actually measures and whether it is a reliable indicator. The Labor Force: Are You In or Out? NOTE: The BLS defines the labor force as persons 16 years of age and older either employed or unemployed and seeking work. BLS "Frequently Asked Questions"; http://www.bls.gov/dolfaq/bls_ques23.htm. 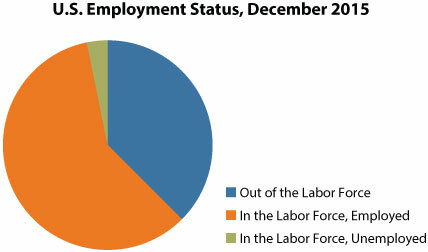 SOURCE: BLS Labor Force Statistics from the Current Population Survey; http://www.bls.gov/web/empsit/cpseea01.htm. Those classified as not in the labor force are not working and not looking for work. So, they are not employed and also not considered unemployed. For example, many full-time college students choose not to work so they can focus on their studies. Some parents choose to stay home to care for their young children. And many older adults retire because they saved and have enough financial resources and no longer have to work. In each case, these people have excluded themselves from the labor force because they do not wish to be employed. Even though they do not have jobs, they are not considered unemployed. Another group classified as not in the labor force is discouraged workers. These are people who do not have a job and are no longer looking for work because they think there are no jobs available to them. Such discouragement is likely to occur during a recession as people lose jobs and then have difficulty finding another one. They likely will not start looking for work until they see signs that the labor market has improved. Because they are neither employed nor actively seeking employment, they are not counted as part of the labor force. To calculate the unemployment rate, the BLS divides the number of people who are unemployed by the total number of people in the labor force (and then multiplies by 100). For example, an unemployment rate of 5 percent indicates that 95 percent of those in the labor force are employed. Economists classify unemployment into three categories: frictional, structural, and cyclical. Frictional unemployment results when people are temporarily unemployed, either because they are new to the job market or are searching for a better job. Structural unemployment is caused by a mismatch in the skills held by those looking for work and the skills demanded by those seeking workers. For example, when an auto assembly plant is moved to another city, the skills held by the plant's former workers may no longer be in demand in the workers' current location. They may have to relocate to cities with auto assembly plants or learn new job skills. Because workers are always entering the labor force and switching jobs, a certain amount of frictional unemployment is inevitable. Likewise, changes in technology and preferences guarantee that economies also suffer from structural unemployment. As such, a certain amount of unemployment is considered natural. Fittingly, the natural rate of unemployment is the sum of frictional and structural unemployment. Cyclical unemployment is associated with jobs lost due to recession; it is the deviation from the natural rate of unemployment. What Is the Unemployment Benchmark? SOURCE: BLS. "Household Data: Table A-15. 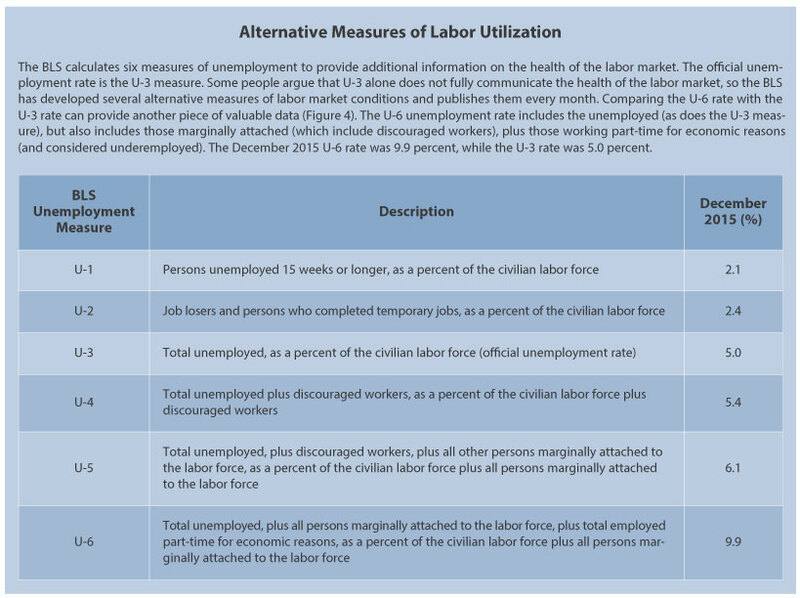 Alternative Measures of Labor Underutilization." Last modified date: December 4, 2015; http://www.bls.gov/news.release/empsit.t15.htm. NOTE: In December 2015, the unemployment rate (blue line) was 5 percent. The 2015:Q4 estimated natural rate of unemployment (red line) was 5.05 percent. Gray bars indicate recessions as determined by the National Bureau of Economic Research (NBER). SOURCE: BLS Civilian Unemployment Rate [UNRATE] and U.S. Congressional Budget Office Natural Rate of Unemployment (Long-Term) [NROU]. Retrieved from FRED® (Federal Reserve Economic Data), Federal Reserve Bank of St. Louis, January 8, 2016; https://research.stlouisfed.org/fred2/graph/?g=34VS. Thinking again about baseball, in assessing a baseball player, team managers likely consider statistics beyond batting average alone. For example, considering the on-base percentage and slugging percentage in addition to batting average might provide a more complete assessment of a player's batting skills. Likewise, there are other useful indicators of the health of the labor market. The labor force participation rate measures the labor force as a percentage of the civilian noninstitutional population.7 Labor force participation rose from 58.1 percent in 1954 to a high of 67.3 percent in 2000 and then started a downward trend (Figure 3). The labor force participation rate as of December 2015 was 62.6 percent. Economists explain that the increase and more recent decrease in the labor force participation rate are largely due to demographic changes. They attribute the increase in the labor force participation rate from 1948 to 2000 largely to two historic shifts: women entering the labor force and the baby boom generation (those born between 1946 and 1964) maturing and entering the labor force. They attribute the recent decline to demographics again: Baby boomers (currently between 52 and 70 years old) leaving the labor force for retirement have reduced the labor force participation rate for both men and women. NOTE: The labor force participation rate rose from 58.1 percent in 1954 to a high of 67.3 percent in 2000 and then started a downward trend. In December 2015 it was 62.6 percent. Gray bars indicate recessions as determined by the National Bureau of Economic Research (NBER). SOURCE: BLS Civilian Labor Force Participation Rate [CIVPART]. Retrieved from FRED®(Federal Reserve Economic Data), Federal Reserve Bank of St. Louis, Federal Reserve Bank of St. Louis, January 8, 2016; https://research.stlouisfed.org/fred2/graph/?g=34VV. Economists disagree, however, about how much of the change in labor force participation is due to demographics alone and how much is due to cyclical (business cycle) factors. Economists who use a more cyclical explanation perceive the decrease in the labor force participation rate as a "bad omen" for the broader economy.8 These economists argue that the relatively low labor force participation rate indicates that the economy is weaker than the (U-3) unemployment rate alone might indicate. For example, having a large number of discouraged workers (who are not counted as part of the labor force) would cause the labor force participation rate to fall and keep the unemployment rate lower than it would otherwise be. NOTE: In December 2015, the U-3 unemployment rate (red line) was 5.0 percent. It peaked at 10 percent after the Great Recession. In December 2015, the U-6 unemployment rate (blue line) was 9.9 percent. It peaked at 17.1 percent after the Great Recession. Gray bars indicate recessions as determined by the National Bureau of Economic Research (NBER). SOURCE: BLS Total Unemployed, Plus All Marginally Attached Workers Plus Total Employed Part Time for Economic Reasons [U6RATE] and BLS Civilian Unemployment Rate [UNRATE]. Retrieved from FRED® (Federal Reserve Economic Data), Federal Reserve Bank of St. Louis, January 8, 2016; https://research.stlouisfed.org/fred2/graph/?g=34GF. The standard unemployment rate (U-3) is an important measure of the health of national labor market conditions. Recent unemployment data indicate that the U.S. economy is near full employment. However, many observers doubt that the unemployment rate fully reflects the reality of underemployed and discouraged workers—both of whom are not counted as unemployed. They often refer to the downward trend in the labor market participation rate as an indication of labor market weakness. However, taken in the context of the demographic shift, the current low unemployment rate is likely an indication of a strong labor market. 1 BLS All Employees: Total Nonfarm Payrolls [PAYEMS]. FRED® (Federal Reserve Economic Data), Federal Reserve Bank of St. Louis; https://research.stlouisfed.org/fred2/series/PAYEMS/. 2 Clifton, Jim. "The Big Lie: 5.6% Unemployment." Gallup. February 3, 2015; http://www.gallup.com/opinion/chairman/181469/big-lie-unemployment.aspx. 3 BLS Labor Force Statistics from the Current Population Survey; http://www.bls.gov/web/empsit/cpseea01.htm. 4 Baseball-reference.com. "League Year-By-Year Batting—Averages." Accessed December 15, 2015; http://www.baseball-reference.com/leagues/MLB/bat.shtml. 5 U.S. Congressional Budget Office Natural Rate of Unemployment (Long-Term) [NROU]. FRED®, Federal Reserve Economic Data, Federal Reserve Bank of St. Louis; https://research.stlouisfed.org/fred2/series/NROU/. 6 Federal Reserve Bank of St. Louis. "St. Louis Fed's Bullard Discusses Five Questions on U.S. Monetary Policy." November 11, 2015; https://www.stlouisfed.org/news-releases/2015/11/06/st-louis-feds-bullard-discusses-five-questions-on-us-monetary-policy. 7 The BLS defines the civilian noninstitutional population as "people 16 years of age and older residing in the 50 states and District of Columbia, who are not inmates of institutions (e.g., penal and mental facilities, homes for the aged) and who are not on active duty in the Armed Forces." BLS "Frequently Asked Questions"; http://www.bls.gov/dolfaq/bls_ques23.htm. 8 For an overview of the "bad omen" and other views, see Bullard, James. "The Rise and Fall of Labor Force Participation in the United States." Federal Reserve Bank of St. Louis Review, First Quarter 2014, 96(1), pp. 1-12; https://research.stlouisfed.org/publications/review/2014/q1/bullard.pdf. 9 Bullard, James. "The Rise and Fall of Labor Force Participation in the U.S." Presented to the Exchequer Club, Washington, DC, February 19, 2014; https://www.stlouisfed.org/~/media/Files/PDFs/Bullard/remarks/Bullard_ExchequerClub_19Feb2014_final.pdf. Cyclical unemployment: Unemployment associated with recessions in the business cycle. Discouraged worker: Someone who is not working and is not looking for work because of a belief that there are no jobs available to him or her. Employed: People 16 years and older who have jobs. Frictional unemployment: Unemployment that results when people are new to the job market, including recent graduates, or are transitioning from one job to another. Labor force: The total number of workers, including both the employed and the unemployed. Labor force participation rate: The percentage of the working-age population that is in the labor force. Natural rate of unemployment: The rate of unemployment that does not contain cyclical unemployment. Recession: A period of declining real income and rising unemployment; significant decline in general economic activity extending over a period of time. Structural unemployment: Long-term joblessness caused by a mismatch in the skills held by those looking for work and the skills demanded by those seeking workers. Underemployed: Wanting a full-time job but having only a part-time job; being overqualified for a job and receiving less pay than would be earned at a job requiring a higher skill level. Unemployed: People at least 16 years old who are without jobs and actively seeking work. Why Is It So Difficult To Buy a High-Quality Used Car?